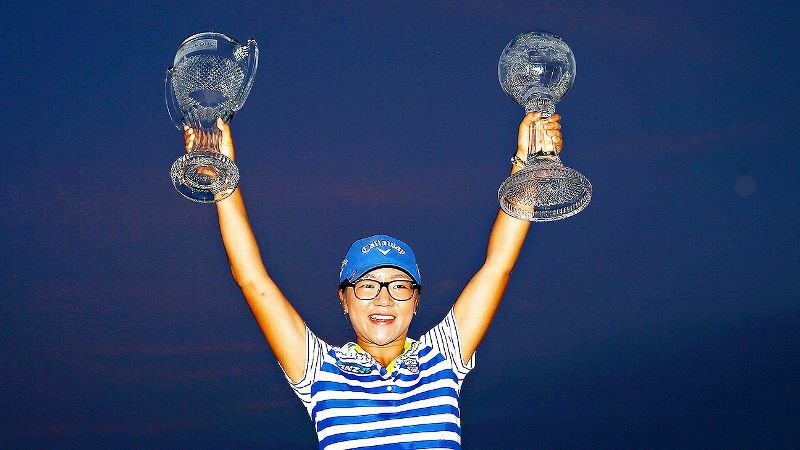 At age 17, Lydia Ko has won five LPGA titles - two of those coming while an amateur. Lexi Thompson is the only other player to win before age 18, and she did so once. NAPLES, Fla. -- You're not supposed to be able to do stuff like this in golf before your 18th birthday. This isn't gymnastics or tennis, where young kids regularly do big things and have for a long time. While teens (and a few preteens) have made more and more of an impact in golf during the past decade-plus -- consider Lucy Li qualifying for the U.S. Women's Open at age 11 this year -- what Lydia Ko has done is unprecedented. 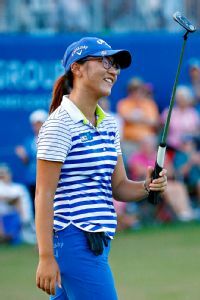 Ko, who turned 17 in April, added significantly to both her bank account and her growing aura with a double victory Sunday at the season-ending CME Group Tour Championship. She had wrapped up the $1 million bonus for the Race for the CME Globe -- an LPGA season-long points system introduced this year -- by the time she got to the final hole of regulation. After finishing at 10-under 278 and tied with Carlota Ciganda and Julieta Granada, Ko would then play that 18th hole four more times before prevailing in the playoff. That brought her the winner's check of $500,000 and gave Ko the richest payday in women's golf. In one day, Ko nearly doubled her career earnings; she had come into this tournament having won $1,589,033 in her first season on tour. Last year at this same tournament, which was her first event as a pro, Ko won $16,063. That's still plenty of money for a teenager, but a pittance compared with the payday Ko gave herself this time. "It wasn't something I was thinking about all day," Ko said of the money. "Everything has happened so quickly. I'm not going to spend it on one big thing, that's for sure." Level-headed, this youngster is. Sunday was Ko's first LPGA playoff, but as with seemingly everything else, she doesn't need much experience to be good at it. Granada was out of the playoff after two holes. Ciganda missed a 6-footer for birdie the third time around that would have won it. And then the fourth time, Ciganda got in trouble on her approach, had to take a drop, and was forced to try to chip in for par. She was unsuccessful at that. Ko was in about the same spot all four times: 18-20 feet away, safely on the right side of the hole. Par, par, par, par. You got the feeling she could have done that another 10 times if that's what it would have taken. Ko, who claimed the LPGA's rookie of the year award even before this tournament, ended the season with three victories and 12 other top-10 finishes. She has not missed a cut in 42 LPGA starts. This is uncharted territory for a golfer her age. The only other player who has won an LPGA title before age 18 is Lexi Thompson, who did so once, at age 16. In four playoff holes, Lydia Ko made four pars and watched as Julieta Granada and then Carlota Ciganda made bogeys. Contrast that with Ko, who now has won eight professional titles at age 17 years, 7 months. Five of those are on the LPGA Tour, with two coming while she was still an amateur. There have been other LPGA rookies who won more than Ko. Nancy Lopez set the standard with nine victories in her rookie season of 1978. But Lopez wasn't a teenager. She turned 21 in January of that year. Furthermore -- and this in no way is intended to disparage past champions -- the reality is that the LPGA of 2014 is far deeper in terms of global talent, and it requires a lot more travel. Lopez was a rookie in the days when the LPGA was dominated by Americans and virtually all the tournaments were in the United States. Now, the best players from all over the world are on LPGA Tour. Just take a look at Sunday's playoff: players from New Zealand, Spain and Paraguay were participating. Ko also is playing at a time when two players in their 20s -- American Stacy Lewis and Korean Inbee Park -- are also producing fantastic golf. Lewis, who finished tied for ninth here, won the season money title, the Vare Trophy for lowest scoring average and was the Rolex player of the year. Park, who tied for 24th, finishes the year with the No. 1 ranking. In other words, Ko has not come along when the tour is at any kind of lull. To the contrary, the LPGA is as talented as it's ever been. Then there's that issue of how much work it is now to put in a full season in terms of the travel. The LPGA had 15 events outside of the United States in 2014. That's a lot of packing and unpacking for a 17-year-old, who admits sometimes she gets in trouble with her parents for wanting to stay in bed and watch TV, just like her peers. She hasn't gotten home to New Zealand in quite a while. But now she'll get that chance, and she'll have plenty of money to buy a few presents for the holiday season. She's extremely remarkable -- phenomenal, actually. She has a great head on her shoulders, and she's here for the long haul. She's not someone who just had a great season but will fade away next year. What makes Ko so good? As simple as it sounds, it's probably the main thing that makes golf so vexing. She's remarkably accurate an incredible amount of time. Ko certainly doesn't blow you away with her distance; she averages just under 250 yards per drive, which ranks in the mid-60s on the LPGA Tour. Compare that with Ciganda, who's in the top five on the tour in driving distance at just over 267 yards. But what Ko does so well is find herself in the fairway time and time again, which is reminiscent of 10-time major winner Annika Sorenstam. Ko is in the top 10 on the tour in greens in regulation and in the top five in scoring average. Sorenstam didn't win her first LPGA title until she was 24. The natural question that follows is whether Ko will have a career that lasts awhile. Her fellow LPGA players think so. "She's extremely remarkable -- phenomenal, actually," said Michelle Wie, who finished tied for fifth here and is a player whom Ko idolized as she was learning the game. "She has a great head on her shoulders, and she's here for the long haul. She's not someone who just had a great season but will fade away next year." There is more for Ko to improve upon, for sure. She wants to be a more consistent putter, for one thing. And she likely will be able to add some distance to her drives as she develops more strength. But we're talking about refinements to what's already there, rather than needing to add anything significant to her game. "I'm excited that the season is over, but it's been great," Ko said, seeming like someone who was eager to go hang out with her friends back home. "This has been a big year, and I've learned so much." It's a nice place to be at 17, if you can handle it emotionally, and Ko has shown so far that she can. Her mother has described Ko as a perpetually happy kid, regardless of what happens on the golf course. And that light-hearted, down-to-earth personality doesn't appear to be altered by success. Maybe that's been Ko's biggest victory of all.